Applications: These discs are a great solution for those wondering how to dry grind aluminium. They are recommended for grinding, shaping, weld removal and edgebreaking on aluminium facbrications, extrusions and castings. They are used on angle grinders rather like traditional grinding discs. 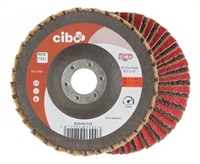 Product Notes: These discs offer several advantages over tradional bonded abrasive discs when grinding aluminium. Firstly, they are safer and will not burst or chip. Secondly, they are lighter and thus easier to control when shaping the aluminium. Thirdly, they last a long time (you can buy just 1), giving consistent performance as they wear down. Fourthly, as the ceramic abrasive is coated, they resist loading up. Finally, although they grind quickly due to the ceramic abrasive, they leave a high quality finish due to the alternate layers of surface conditioning material. It may be that the final finish you require is achieved with just 1 disc in 1 operation. RCDs, or Rapid Combi Discs, are made with alternate layers of ceramic coated cloth backed abrasive and non-woven surface conditioing material. They are patented by Cibo abrasives. Also Available: A full range of Rapd Combi Discs in grades from Very Fine to Ultra Course is stocked. Full details here.